It’s September, it’s definitely autumnal and the teaching term has started! My Wivenhoe group asked to get involved with crewel embroidery so we started from basics and everyone has their own project in mind to finish (?) by January. I decided I would work a small piece alongside them and treated myself to someone else’s design so I could jump straight in. I chose Sue Hawkins‘ Pomegranates. This one of her kits is just right for me because it uses several of exactly the same colours as a cushion I have already worked, so will sit well with that. That earlier one was started in a Philippa Turnbull class and is part of her Levens Hall Pillowe design (which I can’t now see on her website but there are other wonderful designs). Apparently I worked this five years ago – seems like yesterday! 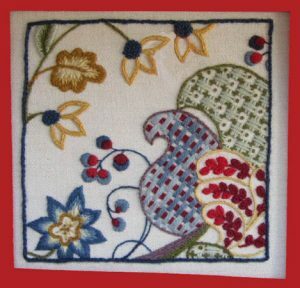 Sue uses a stitch I haven’t come across before. 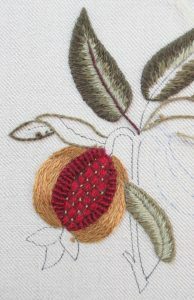 The one down the sides of the open part of the pomegranate. It’s worked the same way as whipping over the spokes of a spider web but done on a ladder of straight stitches. Very effective. I’ve also made progress with my bed quilt. I showed a picture way back in May of a couple of rows. Then I didn’t get to working on it much over the summer. This Saturday I took all my completed rows and started to seam them together – and this time my points mostly meet! These feel somewhat like autumnal colours as well (grey for the rain?) and I am pleased with the way they are blending together, a bit more so than in the photo. 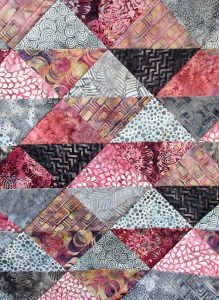 This entry was posted in Crewel work, General, Patchwork by susanrhodes. Bookmark the permalink.